The OX is a flawed yet potentially brilliant design, aimed shamelessly at the top end of the pro market, where most potential customers will already have the means to exploit its current capabilities. Excellent sound quality that can rival that of the world’s best studios. Solid build quality that could handle stage use, too. The OX app is essential for editing but only works on modern iPads and Macs. No rackmount conversion so not ideal for live stages. As modern PA and recording has developed, so has the humble guitar amp loudspeaker attenuator. Invented to allow valve amps to be run in their sweet spot while controlling volume levels, early attenuators were often little more than high-powered resistor networks. However, a loudspeaker is not a resistor and its interaction with a valve output stage is dynamic and complex. Consequently, there have been many attempts to improve on simple load resistor boxes and preserve the elusive response of a classic valve amp, while re-defining the load box’s evolving role as a recording and live sound interface. Up to this point, most of these products have come from amplifier manufacturers but now there’s a new kid on the block from Universal Audio. 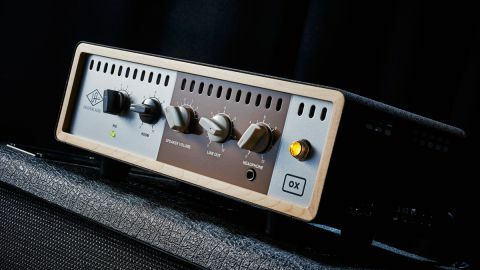 Perhaps not so well- known to guitarists but a byword in pro audio quality and innovation for 60 years, UA’s expertise in digital software plugins and analogue hardware has resulted in an exciting product: the OX amp top box. Beautifully packaged and presented in a heavy-duty steel chassis with wood trim, the OX looks - and indeed is - expensive, but then it does far more than the average attenuator. It has a sophisticated reactive load circuit that properly mimics a loudspeaker’s constantly changing characteristics, so the amp’s dynamics are preserved at any volume level. The OX also features built-in digital cabinet and microphone emulations, together with up to four simultaneous studio-quality effects, including plate reverb, delay, compression and EQ, which are combined in what UA call Rigs. Six of these Rigs can be stored and recalled from a front panel rotary switch, combined with a control called Room, which raises or lowers the ambience and ‘air’ in your preset. Next comes the OX’s speaker volume attenuator control, which has five different levels of loudness, plus an ‘off ’ setting. This works separately to the headphones and line out/mono outputs, which have their own volume controls. The rear panel includes S/PDIF digital connection on RCA phono and optical Toshiba link sockets, amp in/speaker out jacks with a three-position impedance changer, and a pair of line out jacks that accept balanced or unbalanced connections to desks, monitors or any other audio interface. You'll also find a trio of USB sockets and a footswitch jack. Other rear panel items include an on/off switch, a connector for the OX’s external DC power supply and a Wi-Fi indicator LED. The OX has its own Wi-Fi network, which connects to a beautifully crafted app that allows wireless control over the emulated mic positioning, cabinet type and effects stored in each Rig preset, with the ability to store and recall presets and load your favourites into the OX. There are 17 speaker cabinet types with a choice of vintage, NOS and modern loudspeakers and eight close mic options with a further six room mic settings and 100 factory presets to explore. or High Sierra, or iPads running iOS11. There’s currently no support for legacy iOS versions, any iPhone, any Android device or any Windows desktop. Fortunately, we were able to borrow a Macbook Pro and installed the app without any drama. The OX connects to Wi-Fi and hooks up to the app host swiftly, although the connection would drop every twenty minutes or so, allowing us to renew our friendship with the ‘Find My OX’ button. The reactive load attenuator is excellent, with amp-like dynamics and just a sight loss of top end on the lowest setting. We tried the analogue line outs into an RCF Evox 8 PA system and were very impressed with the cab emulations, which sound stunningly realistic, faithfully preserving the complex harmonics of the 633 Ruby head we used as the sound source. The digital output was a little trickier to get working and we had a few issues getting clocks to run in sync - most likely a hardware mismatch with an older card. Given the quality of the analogue line outs, it’s not so much of an issue. The OX’s preset effects were all a little too high in the mix to our ears, but can easily be trimmed in the OX app, where you can also access a deceptively simple-looking parameter called ‘Speaker Drive’. This, essentially, controls the virtual cabinet’s dynamic response and ranges from tight, clear and punchy, to smeared and distorted with ghost notes and octaves approximating cone cry, or a voice coil about to vaporise. Having vaporised several voice coils in our career, we can attest to this parameter’s authenticity! For some guitarists, the OX could easily turn out to be a game-changer; high-quality attenuation aside, the inclusion of top-end professional digital effects as well as dynamic cabinet and microphone modelling could end up replacing at least half of many player’s pedalboards or outboard racks. In particular, the reverb and compressor are two of the best virtual add-ons we’ve ever heard. However, it has its limitations, the biggest being potentially one of its best features: the app. This is great as long as you own an iPad or a Mac running the latest operating system. If you don’t, then sadly you’re just not worthy. Bassists may also gnash their teeth that the industry standard 8x10 is missing from the cabinet emulations. These are early days for the OX so a firmware update or two may address some issues, although UA would not be drawn on future developments. Meanwhile, guitarists who are happy with amp simulations and don’t need the OX’s attenuator functionality should check out Universal’s astounding Apollo recording interface, which offers much wider plugin support. We’ve seen mixing consoles with six-figure price tags shipping with missing features, so perhaps this isn’t so unusual in the world of top-end recording and all will be good in the fullness of time. In the here and now, the OX is a flawed yet potentially brilliant design, aimed shamelessly at the top end of the pro market, where most potential customers will already have the means to exploit its current capabilities.